Touch to play. 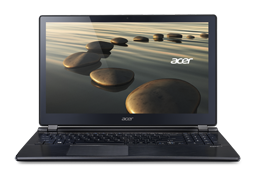 After reviewing the ultrabook-like Acer Aspire V5, we now put our hands on the Acer Aspire V7-582PG. The Full HD touchscreen is to ensure easy use of the Metro interface. The combination of a Core i7 ULV processor and Nvidia GeForce GT 750M even coaxes a smile onto the faces of casual gamers. NVIDIA GeForce GT 750M: Upper mid-range graphics card of the GeForce GT 700M series. Based on the Kepler architecture and manufactured by TSMC in a 28nm process. With these GPUs you are able to play modern and demanding games fluently at medium detail settings and HD resolution. » Further information can be found in our Comparison of Mobile Graphics Cards and the corresponding Benchmark List. 80.33%: This rating should be considered to be average. This is because the proportion of notebooks which have a higher rating is approximately equal to the proportion which have a lower rating.